The Samoyed is a beautiful dog that will require serious grooming time by the owner. 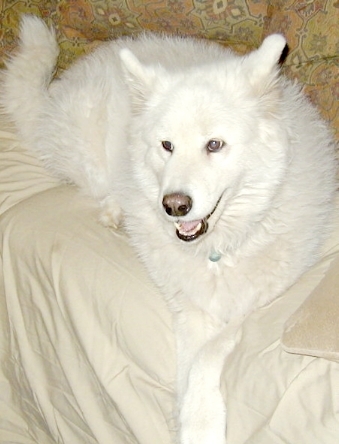 Samoyeds also shed fine white hair on a regular basis. They are a good family dog who loves to play and joke. Good with children and they thrive on being a complete part of the family. Friendly, maybe to a fault, they will bark to announce a strangers arrival and then welcome them with open paws. Samoyeds need regular exercise. They may not do well in hotter climates because of their thick undercoat. Can be chewers if left unattended for period of time. Long, heavy shedders Major OK for apartments if exercised. Not good for hot climates. Can be a one person dog.